Habit: Plant 5--15 m. Leaf: 7--17 cm, linear to oblong, generally entire (crenate to irregularly lobed). Chromosomes: 2n=+-48. Ecology: Rocky slopes, canyons, oak woodland, chaparral; Elevation: 100--500 m. Bioregional Distribution: s ChI (Santa Catalina Island). Flowering Time: May--Jun Note: Threatened by feral animals. Seedling leaves often compound. Citation for this treatment: Steve Junak & Dieter H. Wilken 2012, Lyonothamnus floribundus subsp. 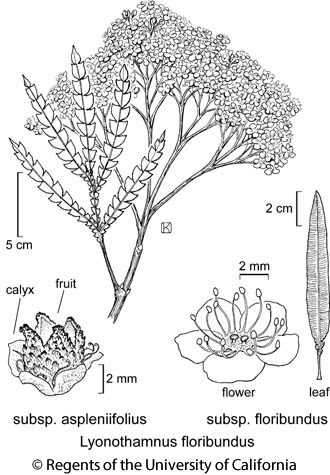 floribundus, in Jepson Flora Project (eds.) Jepson eFlora, http://ucjeps.berkeley.edu/eflora/eflora_display.php?tid=51503, accessed on April 24, 2019. No expert verified images found for Lyonothamnus floribundus subsp. floribundus. s ChI (Santa Catalina Island). Markers link to CCH specimen records. Yellow markers indicate records that may provide evidence for eFlora range revision or may have georeferencing or identification issues. Purple markers indicate specimens collected from a garden, greenhouse, or other non-wild location.